Two ceremonies and one honorary degree highlight first day of celebrations at Grant Hall. The Four Directions Women Singers sing an honour song for Sylvia Maracle (Skonaganleh:ra) after she received an honorary degree from Queen's University. Honorary degree recipient Sylvia Maracle (Skonaganleh:ra) stands with, from left: Principal and Vice-Chancellor Daniel Woolf; Chancellor Jim Leech; Rector Alex da Silva; and Vice-Provost and Dean of the School of Graduate Studies Fahim Quadir. Family members take photos of their graduate as she crosses the stage at Grant Hall during the second ceremony of Fall Convocation on Tuesday, Nov.13. A PhD recipient is hooded on the stage at Grant Hall by Mark Green, Professor and Vice Dean (Graduate Studies and Recruitment) in the Faculty of Engineering and Applied Science, as Principal Daniel Woolf looks on. Principal and Vice-Chancellor Daniel Woolf, left, Chancellor Jim Leech, centre, and Rector Alex da Silva welcome graduate and their supports and families to the first ceremony of Fall Convocation. Fahim Quadir, Vice-Provost and Dean, School of Graduate Studies, takes part in his first convocation ceremony after being appointed on July 1, 2018. Fall Convocation kicked off on Tuesday with the first two ceremonies being held at Grant Hall. 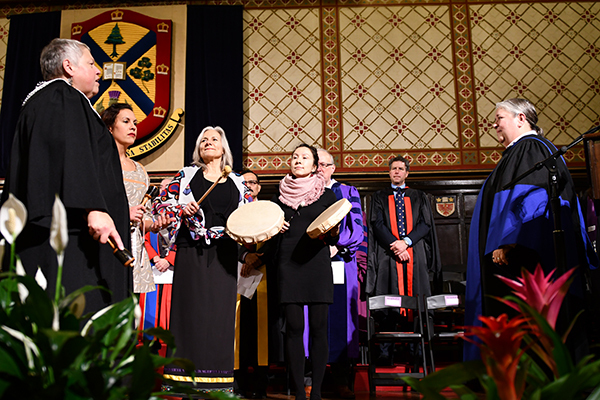 During the afternoon ceremony, an honorary degree was bestowed upon Sylvia Maracle (Skonaganleh:ra), Executive Director of the Ontario Federation of Indigenous Friendship Centres (OFIFC) and an advocate for advancements in justice, health, employment, housing, poverty, and women’s issues for urban Indigenous peoples. Fall Convocation will continue on Wednesday and Thursday with two ceremonies each day. Reeta Roy, President and CEO of The Mastercard Foundation, will receive an honorary degree at the 10 am ceremony on Thursday.